7 mile Christmas day run! I had a great run yesterday with TJ. We ran last Christmas in the cold and rain, but yesterday was sunny and 48 degrees. Not a bad day for a run. So after all the food of the morning, we headed out at lunchtime for a 3 mile run. Two days earlier I had to stop a run after 2 miles because my hip was hurting me too much. It was also very cold and windy and I knew I was tensing up. So I took Christmas Eve off and then headed out with TJ for a slow easy run. We decided to run the route of a 5K we ran in our neighborhood last spring. It isn’t normally a run we can do since part of the run is on a busy, narrow 2 lane road, but being Christmas day, we thought it would be safe. It was a good run and we talked quite a bit about my hip and how I could run more and not get hurt. As we ran, we walked up steep hills since they are painful to me. We also ran at a good pace for recovery. We averaged about 10:50 pace which is about 2 minutes slower than my normal winter pace. After the three miles were up we decided to run a short trail behind our house. This is a flat, easy trail. More like a managed mile long park then a trail. Anyway, we finished that two mile trail and headed home. Nope. By the time we got home, TJ mentioned that just one more mile and we would be at the mileage we ran last Christmas (7 miles), so we headed out for one more. We finished at 7 miles in 1:13:50. Okay, here is the significance of this run. I haven’t run 7 miles or over 70 minutes since my marathon in September. On top of that I really felt great. Very little hip pain and only a moment of pain from my heel spur. I felt so great after this run. Christmas day, beautiful weather, a fun time with my second oldest son and the longest run in nearly 4 months. Today I’m sore, but not doing badly. I have twinges from my hip, but overall feel great. I may walk this afternoon rather than run, just to play it safe. I’ll see after I get home from work. So thank TJ for a fun run and a confidence booster. Oh – and for Christmas TJ said he’d pay for my next marathon. Although I don’t know when that will be, it was such a great gift. Life is good and I’m definitely feeling better about things. I haven’t yet written about my weekend runs because of life getting in the way and my pondering the 11 year old me yesterday. By the way, if you haven’t done so, ask yourself what you would say to the younger you with what you know now. It really is helpful! Yesterday was my off day and I took it with eagerness. I ran 9 days in a row and was quite sore. In fact my hip was really bad, but I walked 3.1 miles yesterday and that seemed to help quite a bit. Anyway, we had a fun run talking the whole time. I was glad to be the one listening more since by the time we hit the 3 mile mark I was about ready to walk. Neill is really improving a lot. It was just a few months ago that our runs would have messed up my pace for the week and now I am pushing to keep up with him! We finished the 6 miles and I had to head out for weekend errands. It was really a beautiful day and seriously a lot of fun. Sunday was another run in the park. TJ, RS and I ran in the park for about 5 miles. TJ asked Saturday if I wanted to go there on Sunday morning, so I said sure. We got there and knowing that he enjoyed the trail run we did right after our marathon (that I had to cut short), I chose to run the trails with my boys. We got half way through and RS wasn’t feeling well so he walked back to the car on the road and TJ and I ran back on the trails. I was a bit apprehensive since my achilles hasn’t been doing too great, but it really felt good. At the end of the trail we still had a half mile to go to make it a total of 5 miles, so we ran up the road and turned back after a quarter mile. I was exhausted, but in order to learn to push through, I ran as hard as I could back to the car. TJ measured us running under 6:00 pace at the fastest, which was exciting to me. Now this week. TJ and I drove the Vulcan 10K course last weekend and it is going to be fun. It is pretty flat other than a mile hill that goes up a mountain. So I am going to try to get my speed up over the next few weeks preparing for the race. I have 3 weeks to get back into racing form, so it isn’t long. Between hill runs and tempo runs, I hope to be able to run the 10K under an 8:00 pace. Actually I hope to hit 7:30/mile. Time will tell. Alright. I never said I was a smart runner. Sometimes I do dumb things. Yesterday, my second day back running after my marathon, I asked TJ if he wanted to go running with me at the State Park. It was a beautiful day. In fact, it was one of those days that if I was training for something, I would have really enjoyed my training day. It was cool, low humidity, not a cloud in the sky. It was awesome. So we decided to go trail running a bit. I don’t trail run (except in marathons) and I am not 100% back from last Sunday’s race. But I digress. We drove to the park and went to the parking lot near the trails. Low and behold we ran into my running buddy Neill (BigBigGeek) running his 12 mile long run (the last before his half marathon next week). He looked great and was enjoying the weather. By the way, he ended up with a 13.1 mile run and felt great doing it. I am so excited for him. A couple of weeks ago we ran an 11 mile run together in the heat and humidity and it was tough. After a few minutes of talking we parted. Neill went on to his record breaking run and TJ and I headed to the trails. We had a fun run overall. Neither of us run trails so we took it easy. After about 1.5 miles the outside of my knee started to hurt. It was annoying and steady, but I kept going. After a while it became obvious that the pain was not going away and in fact was getting worse. I had to start walking. TJ showed me some stretches that helped, but the pain continued. So we walked out to the main road and headed to our car without going back on the trail. The good news is that within a half hour all pain was gone and I didn’t have any issues the rest of the day. I imagine that my muscles are still repairing themselves and running a trail was too hard on them. Oh well, live and learn. It was only a 3 mile run/walk overall and it was probably good we stopped when we did. I did enjoy the run and really enjoyed running trails with TJ. It was a lot of fun. Today is another cool morning but is going to get hot during the day. I’m going to head out for an easy run and enjoy another day of just running for the fun of it!!! Off work today for the 4th of July holiday. I’m going to meet @BigBigGeek to go trail running around the mountain lake. 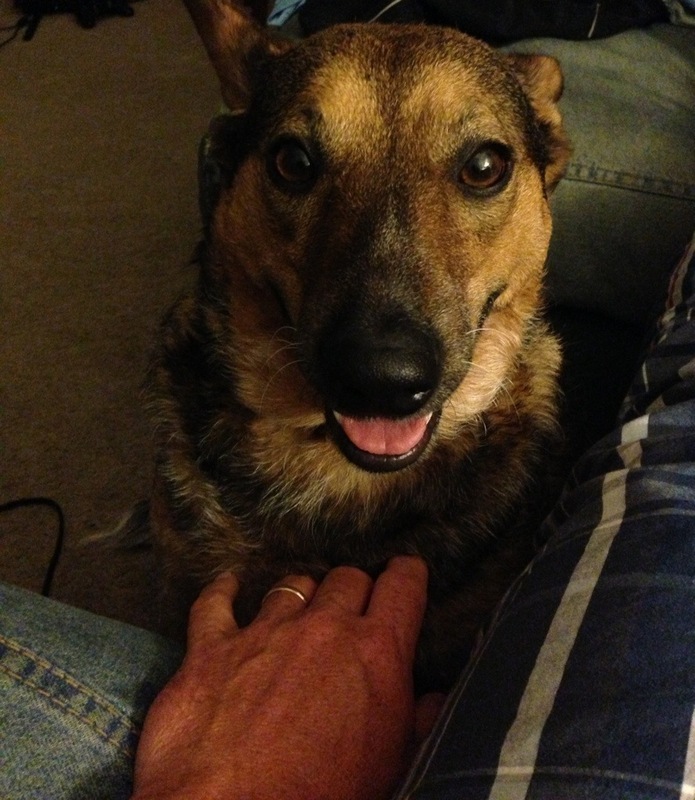 Just “hanging with the dog” before I head out. Is my iPhone 5 GPS measuring my runs wrong? I had an awesome run with Neill ( @BigBigGeek ) yesterday around the same lake as a couple of weeks ago. One thing that bothered me though was the way my iPhone 5 measured the distance. By the time we finished Neill’s Nike watch said we had run 5 miles under a 12 minute pace. My iPhone said we ran 4.58 miles at 13:11 pace. This really made me think. Last weekend on my long run I was running with my iPhone in a belt and though I should have been able to keep up with the goal pace I set, it was like I was behind the whole way. I ended my 13 mile run having to run 1/2 mile further than I thought I had too. I guess it is better to have my phone measure me as going slower and less distance than I actually ran since in a race the distance and time are correct, but it is frustrating that I might be running a minute a mile faster than I think and not know it. Maybe a Nike+ Sportwatch is in my near future. Not much more to report today. I am a bit behind since I didn’t get to this last night. I hope everyone has a great weekend. A new experience for me; trail running! 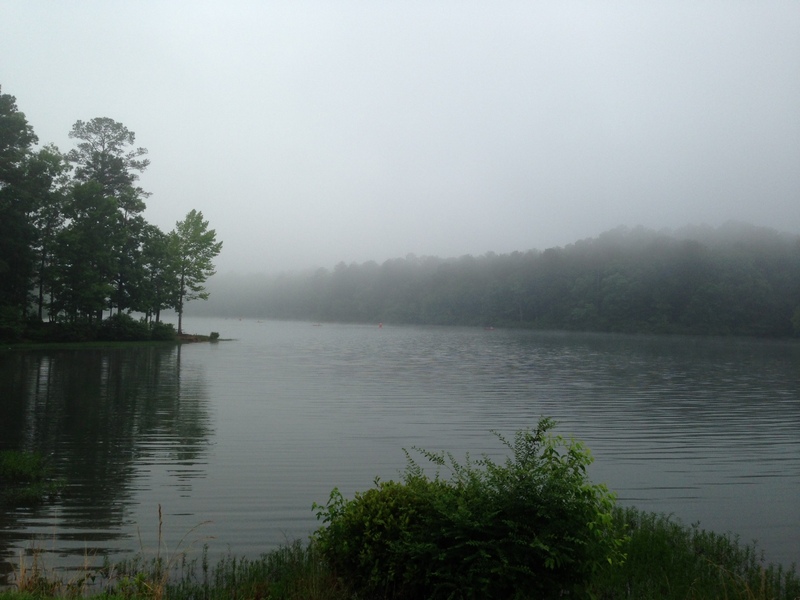 View of the lake right before our run – Beautiful! 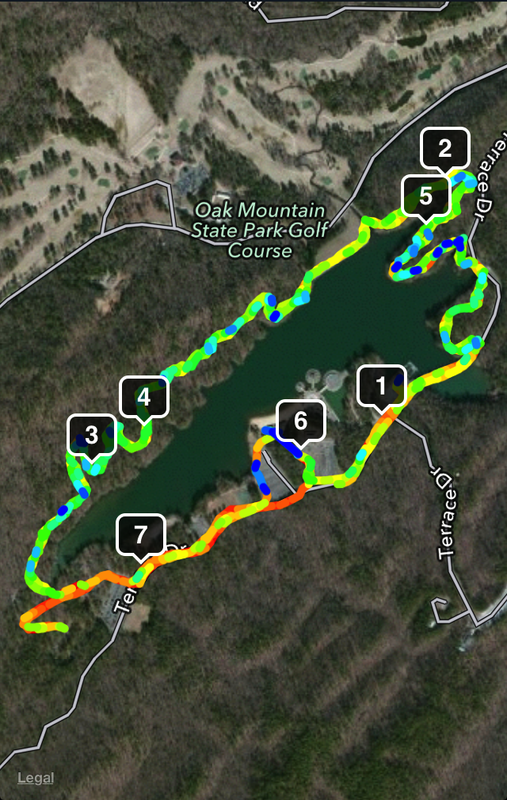 Yesterday I met Neill (@BigBigGeek) at Oak Mtn State park to run trails around the lake. I haven’t been to that park in 10 years, I haven’t trail run much at all and I have never run with Neill. So it was a day of new experiences and a lot of fun. When I first got to the park, I drove to the lake and there was a triathlon going on. Swimmers were in the water and bikers were on their bikes. I have never seen a triathlon before, so it was pretty cool. My late sister was training for a triathlon when she passed away in 2003. I wonder if that might be something I would like to attempt one day. Perhaps a future challenge? I met up with Neill and we went for our trail run. I was hesitant because with all the mileage I’ve put in the past week my achilles has been a bit tender and I was wearing some trail running shoes that I haven’t really used but a couple of miles. It wasn’t a problem. The trail was definitely a trail. Rocks, roots, narrow and other runners and bikers. We ran over 2 miles in one direction and then the same back. Funny, it seemed like it was much more than just a couple of miles. I guess it takes so much concentration not to trip (which I did once) that it just felt longer. I had a great time talking with Neill as we ran and the lake and woods were beautiful. I will be running this trail again. It was fun. After we got through with the trail, I ran with Neill back to his car and then I had to run another 1.5 miles to complete the 7 miles I planned the day. I don’t know what it was, perhaps the trail run, the triathlon, or just all the people walking, biking and playing at the park, but I ran the best 1.5 miles I’ve run in a long time. I felt like I could run as fast as I wanted and as far as I wanted. I just felt free!!! It was fantastic. Running has been laborious lately. The heat hasn’t been too bad, but it was really affected me in a negative way. Everyday the past couple of weeks has been a difficult run other than last Monday with TJ. Yesterday was such a blessing. It was fun running with Neill; it was fun running the trail; it was fun watching the triathloners and it was fun running at the end. It was fun and I am excited about running again.